Recently the Vancouver Olympics debuted the three mascots for the Winter Games in 2010. The mascots are nods to the heritage of the region (no they’re not Bob and Doug McKenzie). 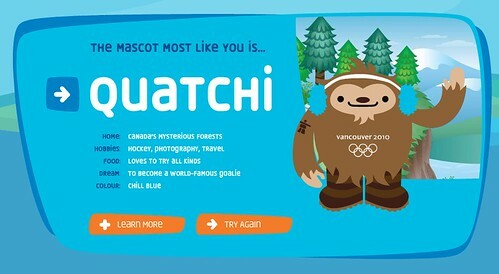 Of the three mascots I really like Quatchi the sasquatch. The mascot selections are always controversial. Doug Haslam doesn’t like them (along with many of the other previous mascots). While I agree with Doug that many of the previous mascots have been, how shall we say, unique. However, I like Quatchi. Love that mascot – looks like a mimobot!